Much of the hotel business is about niches these days: budget, luxury, boutique, all-suites — you name it. The big corporate chains go to great lengths to create various brands to appeal to the exact requirements of the business or leisure traveler, trying to find the ideal sweet spot of price point, comfort and convenience. For all of them, Hotel-Scoop now has some news: there is a remarkable chain out there that combines incredible value with surprising amenities. So why is the existence of this outstanding enterprise still a best-kept secret? Two reasons: it is located in a small country, the entire population of which is fewer than the number of residents in Philadelphia — although, to be sure, it is one of the world’s premier tourism destinations. And secondly, it is disguised under the possibly unfortunate rubric of “youth hostels” — although any resemblance to some of the fleabag places on the planet that can also lay dubious claim to this title is purely coincidental. 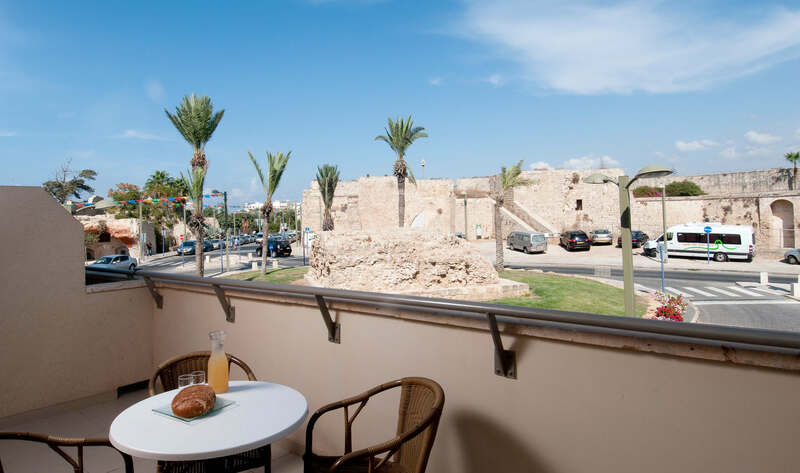 The Israel Youth Hostel Association recently opened the jewel in the crown of its chain of distinctive, “upscale” hostels: The Knights Hostel in Akko (aka Acre) has been built just inside the Old City walls of the Biblical-era coastal city; the stone building seamlessly incorporates the northern port city’s ancient setting into the hostelry’s modern facility. Like all IYHA establishments, the Akko hostel is designed to accommodate groups of students and young adults sleeping up to 4-6 in a room; but they also set aside “family rooms” for parents traveling with children, and private rooms for one or two guests. The private rooms in the Knights Hostel, ideally suited to couples, have the feel more of a boutique hotel than any typical hostel — furnished as they are with comfortable beds and quilts, as well as equipped with flat-screen TV, large bathroom, and mini-refrigerator. Some rooms even feature spacious, sun-drenched, semi-private outdoor balconies that look out onto the impressive fortress walls and the blue Mediterranean Sea; all guests, regardless of room or sleeping arrangements, can experience the rooftop viewing terrace that showcases the architecturally rich town below. The other pleasant surprise about staying with IYHA is that the Knights Hostel, while one the newest and most spectacular in the chain, is by no means unique in offering unbeatable value in stunning locations. 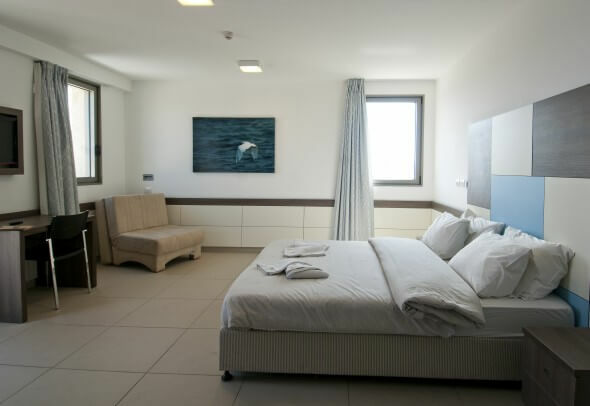 In addition to the Akko property, particulalry noteworthy are: two hostels, Karei Deshe and Poriya, on the slopes of the Sea of Galilee; the Rabin and Agron hostels, both in the heart of the Holy City in Jerusalem; the Jaffa and Yarkon hostels, in lively and bustling Tel Aviv; and the Beit She’an hostel, in walking distance to lesser-known Roman-era ruins that certainly deserve a larger audience. Finally, in Israel’s warmest and most leisure-oriented climes, highly recommended are: the Eilat hostel, in the country’s winter playground, which also boasts some of the best diving and snorkeling anywhere — on the Red Sea; the Masada hostel, at the base of one of the most moving of Jewish historical sites (now also designated a UNESCO World Heritage monument); and the nearby Ein Gedi hostel, convenient to an unforgettable experience at the Dead Sea, the natural wonder at the lowest spot on earth. The one thing missing from all IYHA guest rooms is a telephone. I know landline phones seem passe in this age of cellphones; but there is no way for guests to contact even the front desk, if necessary. It would be a big improvement if IYHA were to install even just an intercom system, for important internal communication purposes. Text by Buzzy Gordon, who was a guest of IYHA for purposes of review. Photos courtesy of IYHA, Jerusalem, Israel.